A New Canaan High School graduate, Chris Silvestri is arguably one of the best players to ever come through New Canaan High School. In 1993, as a captain, New Canaan won the FCIAC & State Championships. Silvestri holds every single major rushing record in New Canaan Football history including Career Yards (2,767), Single Season Rushing Record (1,891), and has the top 3 games for most Rushing Yards in a Game (314, 304, 279). He also holds the record for most carries in a season with 258 and is fourth all time with 385 carries. He holds the record for most rushing touchdowns in a career with 41 and second in a season with 24. Silvestri is the second all-time leading points holder with 258, and the second all-time leading points record in a season with 152. In 1993, his senior season, Chris Silvestri earned All-FCIAC and All-State honors, and won the coveted Gatorade Player of the Year Award for the State of Connecticut. As a safety, Silvestri intercepted 9 passes in his senior season, and had 15 career interceptions at New Canaan. After New Canaan, Silvestri went on to play at Lafayette College where he won one Rookie of the Week award on route to winning a Patriot League Title. He then transferred to Fairfield University where he earned All-American honors, and All-Academic honors in his senior campaign. During his career at Fairfield he won a MAC Title, earned All-MAC honors two times and was a two year captain. He graduated from Fairfield with a BA in Philosophy. After graduation, Silvestri stayed on to coach. He coached Outside Linebackers and the Defensive Backs for three years. Silvestri attended the Graduate School earning an MA in Education. 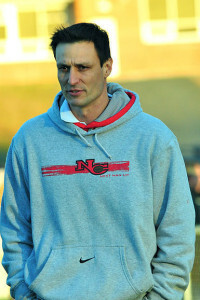 Chris Silvestri has served as the Defensive Backs Coach and Coordinates the Defensive Secondary at New Canaan since 2002. In 2008, New Canaan’s secondary was one of the best in the state, almost impossible to throw on. The 2008 defense intercepted 24 passes on the year and was only scored on twice through the air. Chris was promoted to Defensive Coordinator in 2014 and also won the FCIAC Assistant Coach of the Year Award in his first year as the Defensive Coordinator in 2014. In 2018 he was named Associate Head Coach while maintaining his responsibilities as Defensive Coordinator. Chris is happily married to his wife Danielle.